Students attend a lecture given by alumni Glenn Renwick, retired CEO of Progressive Insurance, as part of the Linda Parker Hudson Engineering Leader In Residence program. The Engineering Leadership Institute impacts undergraduate students from the beginning of their time at the Herbert Wertheim College of Engineering. 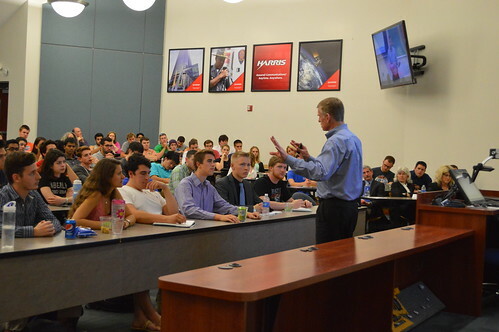 Weekly lectures on engineering leadership are a part of Introduction to Engineering (EGN1002) – often the first elective that engineering majors take. Throughout their undergraduate and graduate studies, students have the opportunity to take classes at the Institute – towards certificate completion, or simply as electives. Guest lectures, like those brought to campus through the Linda Parker Hudson Engineering Leader in Residence program, are often made available to students across the University of Florida campus, with smaller engagements reserved for engineering students. Notable alumni, including Linda Parker Hudson and Tom Hunter, offer awards and scholarships to engineering students who exhibit strong leadership qualities while pursuing their education. Often these students are involved with student organizations, the Benton Engineering Council, opportunities by department, or the Institute’s Engineering Student Leadership Advisory Board.